Soon after the November 2016 presidential election, UCLA welcomed two Activist Fellows for the winter quarter. 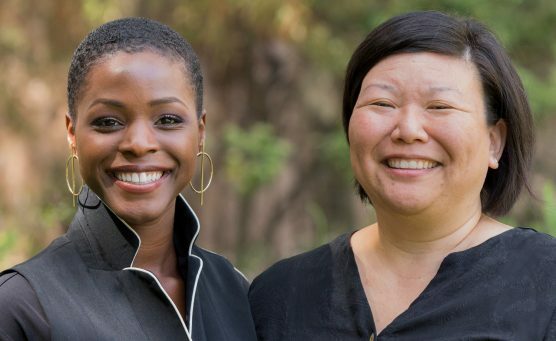 Funmilola Fagbamila and Lisa Hasegawa were the first of what the Institute on Inequality and Democracy at UCLA Luskin hopes will be a continuing series of fellows. Fagbamila, a founding member of Black Lives Matter L.A. and an adjunct professor at Cal State Los Angeles, served as the fellow for the Institute. Hasegawa, who worked in the Bill Clinton administration before serving as executive director of the National Coalition for Asian Pacific American Development, was the UCLA Asian American Studies Center’s fellow. Hasegawa is also a Luskin Senior Fellow. How did the November election and the reaction to it influence your approach to the activist-in-residence fellowships? Fagbamila: I came into the fellowship with a desire to have conversations about how to contextualize the current political moment. When we think about the election and how people were attempting to understand how Trump could have won, it’s important for us to look at the numbers, to look at the history and the patterns of how electoral politics functions at a federal level in the country. A lot of talk is about how the country is just inherently racist, and that’s why somebody who has this kind of sentiment around race, policing and immigration could win. But when we look at the numbers closely, we understand that around 40 percent of the population did not vote at all — because they are so disillusioned with the system as it exists, feeling as though they didn’t have any option in terms of a candidate who could truly represent where they are ideologically. Then you have about 20-25 percent of the people who did vote for Donald Trump, not actually liking him, but feeling that they didn’t have another option. So what does that say about the current political moment and what has been the history and trajectory of federal electoral politics in this country? The reason it was so important for me to be here at this moment, and Lisa as well, is to have conversations and contextualize what’s happening, why it’s happening, how we can resist it, what our resistance has looked like in the past, and figuring out what it is that actually sparks urgency with folks. Hasegawa: With all the talk during and after the presidential election about executive orders, and the Muslim ban, I just felt that I needed to think critically about where I positioned myself after having been in Washington, D.C., for the past 20 years. I was encouraged to apply by some colleagues because I was very vocal about my frustration, even thinking about a new Democratic administration. Returning to the Asian American Studies Center seemed to be the ideal place for me to reflect upon the strategies we employed to move the policy agenda for underserved, low-income Asian Americans and Pacific Islanders. I feel like core democratic institutions are being questioned and strategies to influence policy are being considered in completely new ways that have not been examined in the public dialogue, in the public mind. You have managed to connect a lot of dots when it comes to dissent, arts and scholarship. What has been your inspiration? Fagbamila: It’s a desire to make it known that we can absolutely engage in activism and advocate for those who are most vulnerable within a society while also maintaining health and stable lives for ourselves. There’s a sentiment that exists in the popular imagination, about being a person who advocates for justice meaning that you live an unhappy life, void of joy and fun. Always serious. The idea being that in order to do this type of advocacy work, that one must sacrifice their well-being. This is a false narrative; one that scares many people away from engaging in resistance work that could be potentially transformative. I am inspired to have conversations, through my art and through my scholarship, about the various forms that activism takes, about what it means to both advocate for and work toward a more just society while also taking care of yourself and making your mental, emotional, physical wellness a priority. Specifically within activist communities, we need to emphasize that self-care is not selfish. Self-care done collectively and strategically is what will be the force that enables us to make our resistance efforts sustainable, as opposed to fleeting. Creating movements, as opposed to moments. Hasegawa: There is this desire to reconnect with the languages of politics and policy and with theory and academia. We’re just trying to figure out what this means for Asian Americans and Pacific Islanders in this moment. There has been this fight to gain basic visibility in a lot of spaces, places, reports — just to kind of penetrate into the mainstream psyche and understanding that Asians and Pacific Islanders are American, belong in this country and have helped build this country. I’m so tired of inaccurate stereotypes and data about our communities being used to criticize and punish other communities of color. AAPI artists, cultural workers and organizers are disrupting the narrative and this framing that the Right uses, claiming, ‘Look at Asian Americans, they have overcome barriers despite their race and despite all of these very difficult histories as refugees and immigrants.’ We need to fight against the anti-blackness in our communities, lift up our shared histories of struggle and resistance. What have you been hearing from students? Fagbamila: What I’ve been hearing are questions about how to be a scholar activist, questions about how one can actually consistently engage in what is perceived as time-consuming resistance work while also remaining serious about their scholarship and doing their research. The question has been how to do both and have both of the endeavors allocated the proper amount of time and energy, and I think that’s a conversation around balancing time and also knowing that, for many scholars and academics, their research is part of their resistance. Hasegawa: I have really felt some of the disconnects between the students and the institutions that had been laboring to represent Asian Americans and Pacific Islanders and policy issues. For the most part many students have not even heard of community-based and national advocacy organizations, or they have heard of them but don’t really know the histories of them or don’t really feel connected to the work or the people who are in them. They are hungry for these stories and connections. Also, I have heard their interest in my perspective on what it was like to be at UCLA when the Rodney King verdict came down, and what was it like to be a young person at that time. Figuring out how to encapsulate that experience and share these stories with this generation of students has been a joy — actually, a gift — to me, because it has helped me to realize how influential those times were for me and my understanding of race, advocacy and coalition building. What advice do you have for students in a very uncertain time for Americans? Fagbamila: There are number of ways that people can be of service, but I think oftentimes activism gets conflated into this one thing, this one specific process of choosing an organization, becoming a member, and helping in that particular capacity. But if we think historically about the various ways that people have advocated for societal change, we consider the scholar activists — people who, as I mentioned earlier, engage in transformative work within their scholarship — writing about necessary issues within your area of study, specifically issues that have not been written about or have been silenced within the academy. We need those tools; we need this research in order to push forward. You have many students who also might engage in some amount of activism with their art. Part of my work as a member of Black Lives Matter, an original member, has been to develop the arts and culture component of the organization. Along the same train of thought, my work as an artist and playwright is something that has been absolutely fundamental to what I believe has been my mission. Through the lens of art, through the stage, through theater, through this type of writing to cast light on stories, about blackness, about the black experience, about the complexity of the black political identity — these narratives are most often not captured in mainstream dialogues and images of black people. So my work, in this moment, is to tell stories, as honestly as possible, about black people — about our glory and our pain, our thoughts and our experiences.